Every true Fyora fan must own AT LEAST ten Fyora-themed items to be deemed worthy, by the Queen herself, of being called a ‘Fyora Fanatic’. There are a great number of these items scattered throughout Neopia, ranging from toys all the way to toiletries! The ten must-haves are probably different for each person, but I am here to name the ten items that I believe any Faerie Queen follower must own. If you are a fan of Fyora, then what better way is there to show it other than wearing a shirt designed to represent the love that you have for the phenomenal Faerie Queen? Not only can you wear this shirt everywhere you go, but you can also sleep in it! That would be a bit extreme, no? Well, that is a price you must be willing to pay to attain this magnificent moniker. The best thing about this shirt is its price! You can easily buy one for fewer than 2,000 neopoints in Unis Clothing Shop. Playing a few games of Faerie Caves II - Fyora's Quest will easily grant you enough neopoints to purchase this very important article of clothing. Decorate your neohome with this poster that proclaims to all of Neopia that Fyora does indeed rule, not only over Faerieland, but in your heart as well. There would be no question as to whether or not you truly have a dedication for the Queen if this poster was plastered upon your wall. Take it a step further and hang one on ALL of your walls...*cough*... in ALL of your rooms. This wonderful piece of décor can be bought for 5,000 neopoints at Faerie Furniture in Faerieland. The neohome of a Fyora Fanatic cannot be complete without at least one! Learn how Fyora keeps her gorgeous hair intact by reading Fyora’s Hair Care. All eyes will be on you as you model the Queen’s flawless hair-do. Reading this book will have your hair resembling Fyora’s in no time. Eventually, you will become so great at preparing your hair that you will not even have to refer to the book. This is the goal that you should have in mind the first time that you read it. A true Fyora Fanatic should try and learn the Queen’s secrets without referring to the book at all, which would surely impress the monarch should you ever have the honor and privilege of meeting her. You can find this book in the Faerieland Bookstore for under 3,000 neopoints. Travel the Neopian globe in style by wearing Faerie Queen Wings. As the name implies, these wings are modeled after the Queen’s. However, hers are permanent. They could be for you too if you sew them to the back of your top. Well, almost. A true Fyora Fanatic would purchase a pair of wings to sew onto each of your top pieces. That may be a bit extreme, so I am sure the Queen would understand if you only bought one pair. This item is a bit more expensive than the others, unless you can quickly nab them before anyone else when they stock at Unis Clothing Shop. Feel like royalty even in your sleep as you rest in this magnificent bed. Composed by Fyora herself, each bed has had a personal touch added to it. Each mattress is stuffed with perfection, and you will be reminded of that each time you rest. After all, there will be nothing less than the best for the Faerie Queen! Even the pillows are filled with the perfect amount of feathers. Your head will never complain as it rests on these comfortable cushions. This already-assembled (how convenient!) bed can be bought from Faerie Furniture in Faerieland. It is well worth its price. Have you ever wanted to take a much-needed vacation to Faerieland? Well, saving up for your vacation to Faerieland has never been easier if you own a Fyora Bank! Just drop your neopoints in it and feel the weight of the bank shift as more are added to it each time you earn some neopoints. You will be on your way to Faerieland in no time at all. Even if saving up is not your forte, this item is a great trinket. It is beautiful enough and just the right shade of Fyora’s favorite colors to be added to your collection of must-haves. Pick this item up at the Neopian Gift Shop for only a couple hundred neopoints. The Queen’s castle could not possibly get any closer if you have a replica of it in your front yard! You can even visit it every day if you would like, and the best part is, you do not have to live in Faerieland to do so. Acquire a Fyoras Birdhouse and that is all you need. Set it up on your front lawn, or any part of your yard, and watch as faerie petpets of all shapes and sizes flock to make this castle their home. Your yard will become an instant attraction just by adding this memento to it. Any passersby will undoubtedly know that this neohome houses a Fyora Fanatic. Pick up your castle, oops, birdhouse today at the Neopian Garden Centre in the Neopia Bazaar. There is simply no better way to keep track of important notes and schedules than to attach them to a Fyora-themed bulletin board. The board even comes with assorted colors of stick pins for pinning your important papers or photos to it! Remind yourself of your crazy obsession with Fyora each time you post something on this board. You would never want to forget about your devotion to Fyora, would you? This must-have can be obtained from other pet owners through means of trade or maybe even in their player-owned shop. Get yours today! The perfect Halloween costume is not too far away if you own a Fyora Halloween Mask. The holiday is not all about spooks and scares. It can also be loads of fun, and part of the fun is had by creating the perfect costume for yourself. It does not even have to be Halloween for you to gallivant around wearing this beautiful accessory. 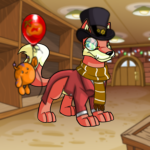 You can literally look like Fyora everywhere you go. It would not be such a bad thing to be mistaken for Her Highness, would it? Fetch yourself a mask from a player-owned shop or from the trading posts and start accessorizing! Well, I guess it goes without saying that you must truly be a Fyora Fanatic if you own one of these. ‘Nuff said, right? So there you have it. These are just a few of the many Fyora-themed items that Neopia has to offer. Whether you are a crazed Faerie Queen fan or just a simple admirer, these items will have you well on your way to becoming a Fyora Fanatic. "Good news, Kazor. You can live," Sloth said to his guard with an unimpressed smirk across his face.